On May 14th, the U.S. Supreme Court decided a very important case addressing the issue of whether a criminal defendant’s Sixth Amendment right to assistance of counsel is violated if their attorney concedes their guilt over their express objection. Ultimately, the majority determined that the client—not the attorney—is at the center of every criminal case, where the client’s choices are whether to plead guilty, seek a jury trial, testify, and (if convicted), whether to appeal. Specifically, even if an attorney feels that their client is not of a sound mind in making a choice, the decision as to whether a defendant is competent to stand trial is not up to their attorney, and it is binding on the attorney concerning that representation. The circumstances of the case—McCoy v. Louisiana—are similar to many circumstances that criminal defense attorneys find themselves in: the defendant has an overwhelming amount of evidence pointing to their guilt, and thus the only real question is whether it would be in their best interest to plead guilty and risk life in prison versus the death penalty. In this case, the client insisted that he was not guilty, and the attorney was unsuccessful in withdrawing as counsel. Instead, the attorney told the jury that his client committed the murders, but was not of a sound mind. The jury found the defendant guilty and sentenced him to death. The Louisiana Supreme Court found that defense counsel’s unwillingness to follow McCoy’s wises did not effectively deny McCoy the assistance of counsel. However, the U.S. Supreme Court ultimately overturned the conviction, noting that a lawyer must abide by a client’s objective to maintain innocence and may not override it by conceding guilt. An attorney also cannot keep a defendant off the stand if they insist on testifying. Inherent in the Sixth Amendment is not only the right to assistance of counsel, but also the right of a criminal defendant to choose the objective of their defense. 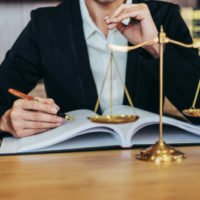 While an attorney may be able to make decisions on trial management, the client has the exclusive right to plead guilty, waive the right to a jury trial, testify on their own behalf, and forego an appeal. This case—like others—is agonizing; arguably because the defendant should never have been found competent to stand trial. Still, lawyers cannot act as judges or juries instead of attorneys representing their clients’ wishes. If you have been accused of a crime, you want to ensure that you are represented by an ethical, effective criminal defense attorney who listens to you and your wishes. If you live in New York or New Jersey, contact our experienced criminal defense attorneys at the office of Phillip J. Murphy today to find out how we can best represent you.